Delicieux Menu Show appealing photos on your restaurant website thanks to the Delicieux menu template. Show off your food and grow your online sales. Do you need a WordPress menu theme? 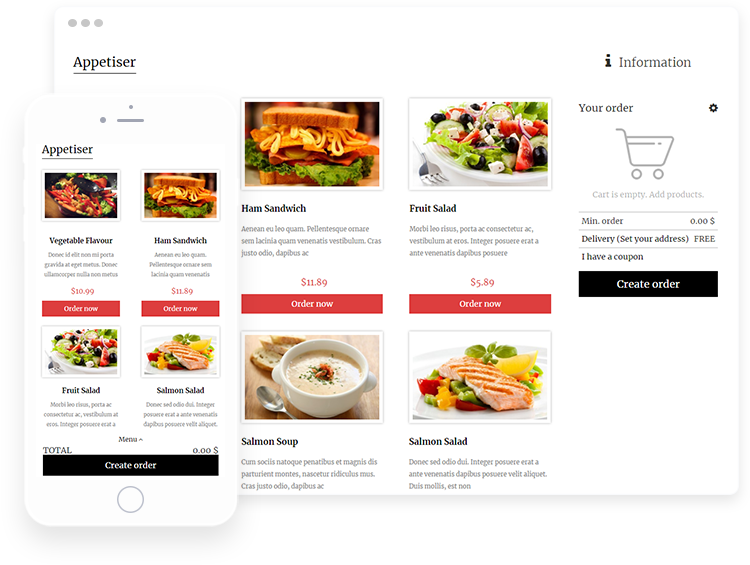 Use the Delicieux WordPress theme menu to run an online food ordering system on your restaurant website. Thanks to the WordPress menu plugin, you can easily start selling online. Implementing the system on your website will not be a problem. Photos that will show more The Delicieux WordPress theme menu is a transparent template. The tiled arrangement of individual menu options allows you to add photos and present them more attractively. In this way, your menu on the restaurant website will start to bring you good profits. Adapt the theme menu to your restaurant Easily and quickly add photos of the dishes and adapt the look of the template to the restaurant website. Showcase your restaurant’s particular ambience. The Delicieux WordPress theme menu will work best if you have really good photos of the dishes on your menu. Show mouth-watering burgers, Thai dishes or sushi -- and earn more! Quick start It is really simple to integrate the UpMenu system with your restaurant website. Use the Wordpress menu plugin and sell food online. The online food ordering system means more orders for your restaurant. And that means more money for you.